LADIES: Get Kutt With Kutt Calhoun Merchandise At 50% Off! LADIES: how are you not going to cop your Kutt Calhoun merchandise at half off?! Check out this outfit we threw together that will definitely keep you cool in this unbearable heat! 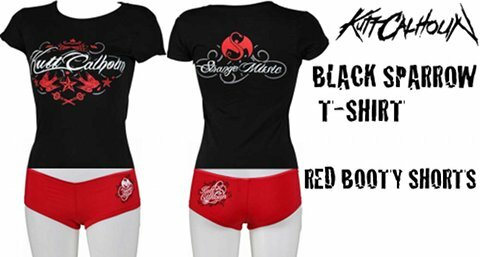 There are over 6,720 different ways to deck yourself out in style with the selection of ladies’ merchandise from Strange Music. Don’t miss your chance at the many outfits that can be coordinated with the variety of t-shirts, hats, shorts, and other merchandise items available at 50% off! Click here to get your merchandise at HALF OFF at strangemusicinc.net!